Amos' brothers Heman, Asa, and Almond were all early Gardner settlers. Sarah's ancestry can be seen on her father John Kemp's page. 1. AMOS3 RAY (HEMAN2, ASA1) was born 02 Mar 1800 in Westminster MA, and died 08 Apr 1883 in Gardner MA. He married (1) SARAH KEMP 05 Oct 1823 in Westminster MA [int 9/5/1823 Gardner MA], daughter of JOHN KEMP and SARAH SHATTUCK. She was born 04 Aug 1800 in Pepperell MA, and died 04 Jul 1832 in Gardner MA. 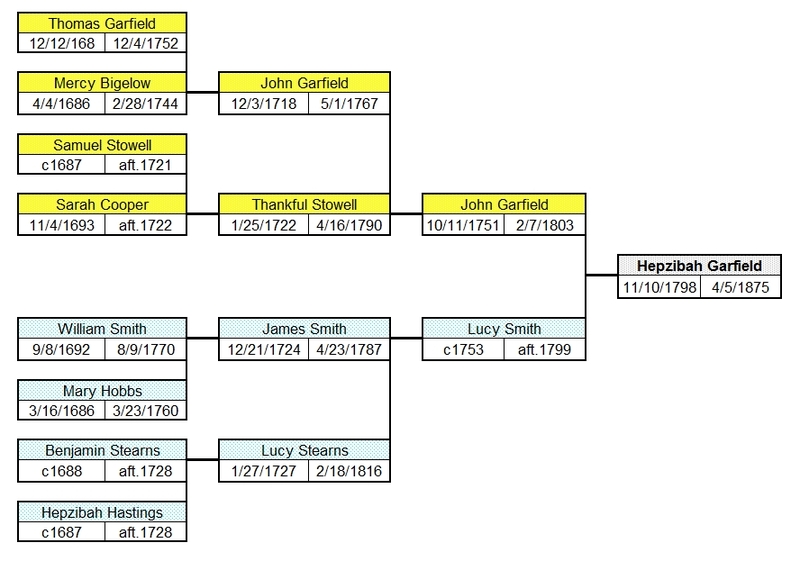 He married (2) HEPZIBAH GARFIELD 11 Apr 1833 in MA, daughter of JOHN GARFIELD and LUCY SMITH. She was born 10 Nov 1798 in Marlborough NH, and died 05 Apr 1875 in Gardner MA. 2. i. ELIZA ANN4 RAY, b. 20 Mar 1824, Westminster MA; d. 09 Apr 1900, Gardner MA. 3. ii. SARAH MARY RAY, b. 26 Oct 1825, Westminster MA; d. 24 Apr 1909, Cambridge MA. 4. iii. ELVIRA RAY, b. 03 Jul 1828, Gardner MA; d. 25 Dec 1905, Gardner MA. iv. CHARLES HUDSON RAY, b. 21 Jul 1830, Gardner MA; d. Aft. 1850.
v. LUCY G4 RAY, b. 04 Jul 1837, Gardner MA; d. 1919. 2. ELIZA ANN4 RAY (AMOS3, HEMAN2, ASA1) was born 20 Mar 1824 in Westminster MA, and died 09 Apr 1900 in Gardner MA. She married SAMUEL GERRY GATES 07 Mar 1843 in Gardner MA, son of NATHAN GATES and DEBORAH GEARY. He was born 07 Mar 1820 in Manchester VT, and died 05 Oct 1876 in Gardner MA. i. HELEN E5 GATES, b. 30 Mar 1844, Gardner MA; d. 26 Jan 1847, Gardner MA. ii. EDWARD S GATES, b. 24 Jun 1845, Gardner MA; d. Aft. 1855. 5. iii. EVELINA MARIA GATES, b. 21 Aug 1848, Gardner MA; d. 1936. 6. iv. FREDERICK B GATES, b. 19 Jan 1852, Boston MA; d. 1937. 7. v. MARION ADELLA GATES, b. 25 Jul 1853, Gardner MA; d. 1936.
vi. MILO HUDSON GATES, b. 29 Jul 1864, Gardner MA; d. Aft. 1930; m. PAULINE GAVIT, 04 Oct 1892, Stockbridge MA; b. Abt. 1860, NY; d. Aft. 1930. 3. 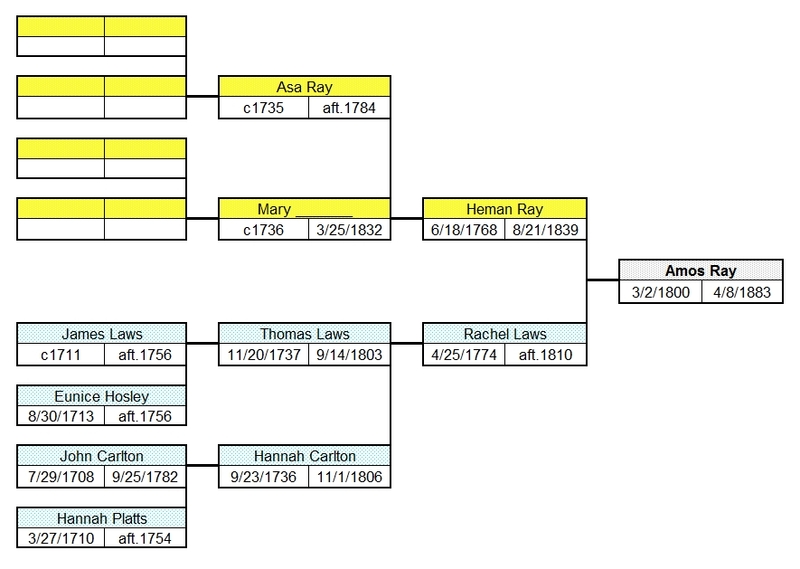 SARAH MARY4 RAY (AMOS3, HEMAN2, ASA1) was born 26 Oct 1825 in Westminster MA, and died 24 Apr 1909 in Cambridge MA. She married DAVID HOWE 06 May 1845 in Gardner MA, son of WINSLOW HOWE and PATTY KIMBALL. He was born 24 Sep 1822 in Templeton MA, and died 10 Aug 1892 in Cambridge MA. i. ELLEN MARIA5 HOWE, b. 31 Aug 1850, Marlborough MA; d. Aft. 1868; m. WILLIAM DEANE, 06 May 1868, Cambridge MA; b. Abt. 1845. 8. ii. CAROLINE E HOWE, b. Abt. 1853, VT; d. 12 Mar 1885, Pelham NH. 9. iii. CORA JOSEPHINE HOWE, b. 02 Apr 1857, Cambridge MA; d. Aft. 1940. 10. iv. LAFOREST D HOWE, b. 19 Mar 1862, Cambridge MA; d. Aft. 1930. 11. v. ARTHUR LEFRANCIS HOWE, b. 12 Sep 1868, Cambridge MA; d. 16 Aug 1912, Watertown MA. 4. ELVIRA4 RAY (AMOS3, HEMAN2, ASA1) was born 03 Jul 1828 in Gardner MA, and died 25 Dec 1905 in Gardner MA. She married (1) JAMES PRIEST. He was born Abt. 1821 in NH, and died Aft. 1860. She married (2) WILLIAM H SMITH. 12. i. JAMES GILMAN5 PRIEST, b. 02 Jan 1850, Marlborough MA; d. 12 Jan 1901, Gardner MA. ii. CHARLES F PRIEST, b. Abt. 16 Jun 1851, MA; d. 05 Mar 1916, San Francisco CA; m. FRANCES A ?, Abt. 1885; b. Oct 1857, VT; d. Aft. 1930. 5. EVELINA MARIA5 GATES (ELIZA ANN4 RAY, AMOS3, HEMAN2, ASA1) was born 21 Aug 1848 in Gardner MA, and died 1936. She married CHARLES EDWARD POWERS 21 Jun 1867 in Gardner MA, son of JOSEPH POWERS and MARY CONANT. He was born 19 Aug 1848 in Gardner MA, and died 1925.
i. ELLA MARION6 POWERS, b. 01 Feb 1868, Gardner MA; d. 1958; m. ? ?. 13. ii. ELVA LIZETTE POWERS, b. 16 Mar 1873, Gardner MA; d. 1923.
iii. FRANK SAMUEL POWERS, b. 21 Dec 1874, Gardner MA; d. 22 Jan 1877, Gardner MA. iv. WALTER JOSEPH POWERS, b. 30 Jan 1877, Gardner MA; d. 24 Feb 1880, Gardner MA. 14. v. CHARLES ARTHUR POWERS, b. 07 Sep 1880, Gardner MA; d. Aft. 1910. 15. vi. CORA ELIZA POWERS, b. 09 Oct 1883, Gardner MA; d. May 1967, Worcester County MA. 6. FREDERICK B5 GATES (ELIZA ANN4 RAY, AMOS3, HEMAN2, ASA1) was born 19 Jan 1852 in Boston MA, and died 1937. He married EVA MABEL PUFFER 03 Feb 1883 in Gardner MA, daughter of CHARLES PUFFER and LOIS GOODWIN. She was born 25 Feb 1861 in Ashburnham MA, and died 1939.
i. SAMUEL A6 GATES, b. 21 May 1894, Gardner MA; d. 01 Nov 1987, Gardner MA; m. GRACE B ? ; b. Abt. 1898, MA; d. Aft. 1920. 7. MARION ADELLA5 GATES (ELIZA ANN4 RAY, AMOS3, HEMAN2, ASA1) was born 25 Jul 1853 in Gardner MA, and died 1936. She married JAMES FREEMAN SMITH 16 Dec 1871 in Gardner MA, son of JOSEPH SMITH and ELIZABETH YOUNG. He was born Nov 1848 in Unity NH, and died 1935. 16. i. LEVI EDWARD6 SMITH, b. 09 Jan 1873, Gardner MA; d. Aft. 1930.
ii. MARION EVELYN SMITH, b. 19 Sep 1874, Gardner MA; d. 1956. 17. iii. WALDO GATES SMITH, b. 11 Sep 1876, Gardner MA; d. Bet. 1930 - 1940.
iv. FRANCIS HENRY SMITH, b. 05 Apr 1881, Gardner MA; d. Aft. 1930. 8. CAROLINE E5 HOWE (SARAH MARY4 RAY, AMOS3, HEMAN2, ASA1) was born Abt. 1853 in VT, and died 12 Mar 1885 in Pelham NH. She married WARREN F CENTER 13 Dec 1871 in Cambridge MA, son of RODNEY CENTER and ELIZABETH ?. He was born Abt. 1845 in Chelmsford MA, and died 07 Mar 1885 in Pelham NH. i. WALTER WINSLOW6 CENTER, b. 31 Oct 1871, Chelmsford MA; d. Bef. 1880.
ii. JOHN LYMAN CENTER, b. Abt. 1873, Cambridge MA; d. 23 Apr 1945, Brattleboro VT; m. BESSIE EDNA KEALTEY, 29 Sep 1897, Boston MA. iii. EUGENE DAVID CENTER, b. 15 Jul 1877, Chelmsford MA; d. Aft. 1905; m. MARGARET B SHOECRAFT, 23 Aug 1905, Boston MA. iv. EDNA HOWE CENTER, b. 29 Jan 1880, Chelmsford MA; d. Aft. 1880.
v. HELEN A CENTER, b. 09 Oct 1881, Chelmsford MA; d. Aft. 1907; m. (1) HARRY U RUSSELL, 09 Oct 1907, Hudson NH; b. Abt. 1882; m. (2) BENJAMIN S LOCKE, 27 Nov 1912, North Chelmsford MA; b. Abt. 1877. 9. CORA JOSEPHINE5 HOWE (SARAH MARY4 RAY, AMOS3, HEMAN2, ASA1) was born 02 Apr 1857 in Cambridge MA, and died Aft. 1940. She married THEODORE P B CLARK Abt. 1873, son of JOHN CLARK and ABBY ?. He was born Jan 1851 in MA, and died Bet. 1920 - 1940.
i. MARIE ANTOINETTE6 CLARK, b. 13 Apr 1875, Cambridge MA; d. Aft. 1894; m. JOHN HAMILTON, 16 May 1894, Brookline MA. ii. THEODORE PARKER CLARK, b. 19 Jul 1881, Cambridge MA; d. Aft. 1910.
iii. ARTHUR BOWEN CLARK, b. 13 Sep 1882, Cambridge MA; d. Aft. 1910; m. ETHEL STEWART WOOD. iv. MADELINE CECELIA CLARK, b. 15 Sep 1886, Cambridge MA; d. Aft. 1905; m. HERBERT NEWELL RIDGWAY, 20 Jun 1905, Cambridge MA. v. EARL HOWE CLARK, b. 30 Sep 1892, Cambridge MA; d. Aft. 1920. 10. LAFOREST D5 HOWE (SARAH MARY4 RAY, AMOS3, HEMAN2, ASA1) was born 19 Mar 1862 in Cambridge MA, and died Aft. 1930. He married CARRIE G GOODRICH 04 Apr 1883 in Cambridge MA. She was born Aug 1863 in Boston MA, and died Aft. 1930.
i. LA FOREST HARRIS6 HOWE, b. 01 Oct 1883, Cambridge MA; d. Aft. 1910.
ii. CHESTER LEROY HOWE, b. 22 Oct 1885, Cambridge MA; d. Aft. 1919; m. JESSIE ROLLINS FOGG, 19 Aug 1919, Hampton Falls NH; b. Abt. 1893.
iii. HARRY R HOWE, b. Aug 1888, MA; d. Aft. 1920.
iv. WALLACE L HOWE, b. 07 Jul 1898, Watertown MA; d. Aft. 1920. 11. ARTHUR LEFRANCIS5 HOWE (SARAH MARY4 RAY, AMOS3, HEMAN2, ASA1) was born 12 Sep 1868 in Cambridge MA, and died 16 Aug 1912 in Watertown MA. He married NELLIE FRANCES HARMON 24 Dec 1890 in Cambridge MA, daughter of WILLIAM HARMON and MARY STEVENS. She was born Sep 1872 in Charlestown MA, and died Aft. 1914.
i. DAVID (HAROLD) FRANCIS6 HOWE, b. 19 Sep 1892, Cambridge MA; d. Aft. 1913; m. MARY AGNES GRANT. ii. LILLIAN MARY HOWE, b. 05 Oct 1895, Cambridge MA; d. Aft. 1910.
iii. ETHEL MARION HOWE, b. 26 Dec 1897, Cambridge MA; d. Aft. 1910.
iv. ARTHUR LEFRANCIS HOWE, b. 13 Nov 1909, Watertown MA; d. Aft. 1910. 12. JAMES GILMAN5 PRIEST (ELVIRA4 RAY, AMOS3, HEMAN2, ASA1) was born 02 Jan 1850 in Marlborough MA, and died 12 Jan 1901 in Gardner MA. He married SARAH JANE POLLARD 06 Dec 1874 in Gardner MA, daughter of EDMUND POLLARD and MARIA GATES. She was born Abt. 1855 in MA, and died 23 Mar 1899 in Gardner MA. 18. i. JAMES HENRY6 PRIEST, b. 13 Jul 1876, Gardner MA; d. Aft. 1940. 13. ELVA LIZETTE6 POWERS (EVELINA MARIA5 GATES, ELIZA ANN4 RAY, AMOS3, HEMAN2, ASA1) was born 16 Mar 1873 in Gardner MA, and died 1923. She married CHARLES CONANT BROOKS 09 Oct 1895 in Gardner MA, son of EUCLID BROOKS and FLAVILLA ADAMS. He was born 08 Apr 1873 in Gardner MA, and died 1949.
i. EVELYN REBECCA7 BROOKS, b. 01 Jul 1896, Gardner MA; d. Aft. 1920.
ii. HERBERT EUCLID BROOKS, b. 12 May 1898, Gardner MA; d. Aft. 1920.
iii. RACHEL BROOKS, b. 24 Mar 1902, Gardner MA; d. Aft. 1930. 19. iv. MIRIAM BROOKS, b. 03 Oct 1904, Gardner MA; d. 25 Jul 1986, Gardner MA. v. CHARLES CONANT BROOKS, b. 30 Jul 1914, Gardner MA; d. Aft. 1930. 14. CHARLES ARTHUR6 POWERS (EVELINA MARIA5 GATES, ELIZA ANN4 RAY, AMOS3, HEMAN2, ASA1) was born 07 Sep 1880 in Gardner MA, and died Aft. 1910. He married HARRIET RICHARDSON WILSON 09 Jun 1906 in Fitchburg MA, daughter of CHARLES WILSON and GERTRUDE HAWKINS. She was born 25 Jun 1882 in Northborough MA, and died Aft. 1910.
i. WILSON G7 POWERS, b. Abt. 1909, Palmer MA; d. Aft. 1910. 15. CORA ELIZA6 POWERS (EVELINA MARIA5 GATES, ELIZA ANN4 RAY, AMOS3, HEMAN2, ASA1) was born 09 Oct 1883 in Gardner MA, and died May 1967 in Worcester County MA. She married WALTER F CROUCH 26 Dec 1901 in Gardner MA, son of ARTHUR CROUCH and SARAH FREEMAN. He was born 30 May 1879 in Osage IA, and died 25 Jun 1912 in Gardner MA. i. VIOLA7 CROUCH, b. 26 May 1902, Gardner MA; d. 06 Jun 1902, Gardner MA. ii. HELENA A CROUCH, b. 29 Jun 1903, Gardner MA; d. 04 Nov 2002, Gardner MA. 20. iii. ARTHUR EDWARD CROUCH, b. 27 Jun 1907, Worcester MA; d. 10 Aug 1989, CA. iv. ROBERT M CROUCH, b. 16 Feb 1909, Webster MA; d. 09 Aug 1994; m. MARIAN ALICE EDGELL; b. 24 Apr 1908, Gardner MA; d. 26 Oct 1992.
v. CHARLES WAYLAND CROUCH, b. 27 Jan 1912, Gardner MA; d. 29 Jun 2001, Tucson AZ; m. CATHERINE BRUNDRETT; b. 28 Apr 1913, OH; d. 09 Oct 2001, Pima County AZ. 16. LEVI EDWARD6 SMITH (MARION ADELLA5 GATES, ELIZA ANN4 RAY, AMOS3, HEMAN2, ASA1) was born 09 Jan 1873 in Gardner MA, and died Aft. 1930. He married HARRIET W RAMSDELL 26 Oct 1898 in Gardner MA, daughter of LEDOIT RAMSDELL and MARY TAGGART. She was born Jan 1875 in MA, and died Bet. 1920 - 1930. 21. i. ROGER RAMSDELL7 SMITH, b. 11 Oct 1902, Gardner MA; d. Aft. 1940. 17. WALDO GATES6 SMITH (MARION ADELLA5 GATES, ELIZA ANN4 RAY, AMOS3, HEMAN2, ASA1) was born 11 Sep 1876 in Gardner MA, and died Bet. 1930 - 1940. He married INA S MINOTT 03 May 1899 in Baldwinville MA, daughter of FRANK MINOTT and PHEBE PIERCE. She was born Abt. 1880 in NH, and died Aft. 1940.
i. LOUISE MINOTT7 SMITH, b. 05 Sep 1904, Boston MA; d. Aft. 1930.
ii. HELEN ELIZABETH SMITH, b. 09 Sep 1908, Boston MA; d. Aft. 1930.
iii. LAWRENCE WALDO SMITH, b. 12 Jan 1911, Boston MA; d. Aft. 1930.
iv. ELEANOR A SMITH, b. Abt. 1919, MA; d. Aft. 1930. 18. JAMES HENRY6 PRIEST (JAMES GILMAN5, ELVIRA4 RAY, AMOS3, HEMAN2, ASA1) was born 13 Jul 1876 in Gardner MA, and died Aft. 1940. He married LILLIE E SCOTT 15 May 1901 in Gardner MA, daughter of JOHN SCOTT and EMILY BRITT. She was born Abt. 1879 in NJ, and died Aft. 1940.
i. MILDRED SARAH7 PRIEST, b. 08 Apr 1902, Gardner MA; d. Aft. 1920.
ii. DOROTHY E PRIEST, b. Abt. 1912, MA; d. Aft. 1930.
iii. MARJORIE E PRIEST, b. Abt. 1914, MA; d. Aft. 1930.
iv. VIRGINIA L PRIEST, b. Abt. 1915, MA; d. Aft. 1930. 19. MIRIAM7 BROOKS (ELVA LIZETTE6 POWERS, EVELINA MARIA5 GATES, ELIZA ANN4 RAY, AMOS3, HEMAN2, ASA1) was born 03 Oct 1904 in Gardner MA, and died 25 Jul 1986 in Gardner MA. She married PHILLIP HENRY CUTTER, son of LEWIS CUTTER and EVELYN SHUTE. He was born 31 Jan 1906 in Gardner MA, and died 04 Nov 1976 in Gardner MA. i. BENJAMIN B8 CUTTER, b. 09 Feb 1939; d. 20 Jul 2002, Leominster MA. 20. ARTHUR EDWARD7 CROUCH (CORA ELIZA6 POWERS, EVELINA MARIA5 GATES, ELIZA ANN4 RAY, AMOS3, HEMAN2, ASA1) was born 27 Jun 1907 in Worcester MA, and died 10 Aug 1989 in CA. He married RUTH PHILLIPS BURRELL, daughter of ARTHUR BURRELL and MARTHA BEARCE. She was born 01 Jan 1909 in Gardner MA, and died 07 Mar 1999 in Middletown RI. i. ALLEN BURRELL8 CROUCH, b. 01 Apr 1938, CA; d. 02 Jan 1980, San Diego CA. ii. MARTHA E CROUCH, b. 17 Nov 1939, CA; d. 31 Oct 2007; m. ? SANTOS. 21. ROGER RAMSDELL7 SMITH (LEVI EDWARD6, MARION ADELLA5 GATES, ELIZA ANN4 RAY, AMOS3, HEMAN2, ASA1) was born 11 Oct 1902 in Gardner MA, and died Aft. 1940. He married FLORENCE P ?. She was born Abt. 1908 in MA, and died Aft. 1940.
i. NATALIE8 SMITH, b. Abt. 1931, MA; d. Aft. 1940.
ii. NEIL W SMITH, b. Abt. 1934, MA; d. Aft. 1940.